The Best Damn Book Box is a new subscription company just making its way onto the subscription floor, and I grabbed one for their first month! So the packaging was a larger box than I was expecting, so obviously with a larger box, I expected larger items. I was deceived with this thought. Right on top was the postcard, which kept true to the theme this month, being “The Nightmare Before Christmas”. However, I thought the lack of branding for BDBB on the card was odd. Even if it said “Best Damn Book Box presents The Nightmare Before Christmas” or something. To just have it say the theme with no company name I thought was a little strange. So the first item I found in the box had been posted on their Instagram, and it was the bookmarks by Bibliofox. I believe that these were custom made, as they cannot be purchased from their store, however they are absolutely ADORABLE and as a HUGE NBC fan, I am thrilled they were included. The rest of the items were handmade by the creator of the box Nicole. I’m 100% all for handmade items, however for the price point of the box, I did feel that a few other items from small shops ought to have been included. The first item was a Deadly Nightshade glitter bottle necklace. Unfortunately, I would never wear it as a necklace, so I cut the rope and tied it shorter so I could use it as an ornament. It’s cute, just not for its original purpose. Next was a (I believe they’re bottle caps?) necklace. These were randomly dispersed through the boxes, so it was a complete lottery which character you received. I received Lock, Shock and Barrel (who I love), however this necklace, again, isn’t something I’d probably wear. Finally, the handmade candle, which is the prettiest of the three handmade items in the box. I love the way it looks when it burns (the glitter starts swirling), and it smells great! I wish it had been a pack of 2 maybe with two different colors or scents. 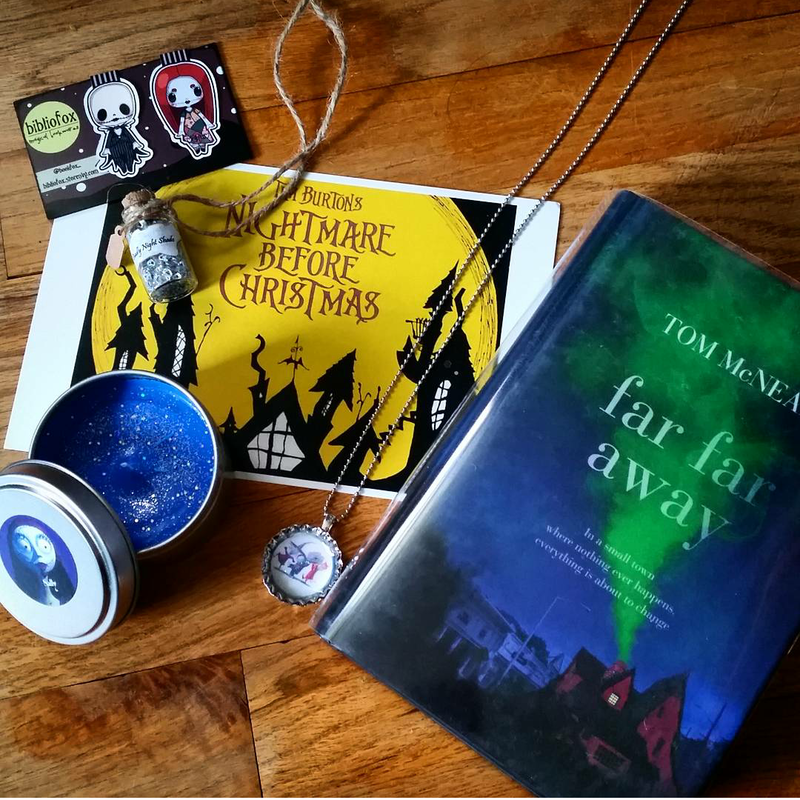 Finally, the book included was Far Far Away by Tom McNeal. I was under the impression that this box would be included Bestselling New Releases, and this book was published in 2013. Luckily I don’t own this book so receiving a duplicate this month wasn’t an issue, but I know a lot of people would be deterred at the chance of receiving a book they already own. The book itself was a little…bizarre. I don’t know if it’s the way the book comes, or if it’s just this edition, but it had one of those plastic sleeves over top of it, similar to library books to prevent stains, and I wasn’t a fan of that. Overall, this box had a lot of love put into it. 3 / 4 items were handmade by the owner of the box, so I have to give credit to her for that. Great job on mass producing so many items for your subscribers. I would recommend not posting AS MANY spoilers on Instagram however – the surprise when opening the box is the best part, and most of the items were posted prior to being received by subscribers. With the price of this box being $39.99 a month, I would expect great quality items. In comparison, Owlcrate charges $29.99 a month and you receive 3 – 4 great quality, professionally made items (even if they are a little quirky) and a brand new book, fresh from the printer. I am signed up with BDBB through March, so I’m eager to see how the company will change as it grows and becomes more popular. If you’re interested in receiving a future Best Damn Book Box, be sure to head over to their website and sign up! January’s theme is Alice in Wonderland!